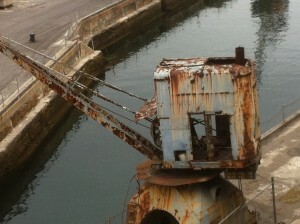 Today the Designer Chicks visited the World Heritage listed Cockatoo Island for a private tour. I am ashamed to say this is the first time I have visited the place and become aware of its potted history. Like most people I knew it had been a shipbuilding and dockyard facility and even was vaguely aware of submarines being refitted here, however, had no idea it had been used to house young, orphaned boys and girls. Its original use as a convict goal seems obvious but not necessarily something I would have been able to tell a visitor. 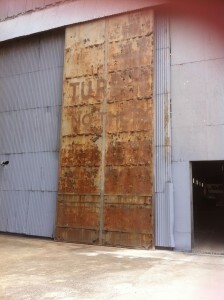 The Harbour Trust has been regenerating Cockatoo Island since 2001 and it is great to see the layers of history being preserved. The old and the not so old siting hand in hand with each other. The size of the sandstone blocks hand chiselled by convicts, still standing proudly against the back drop of the harbour. 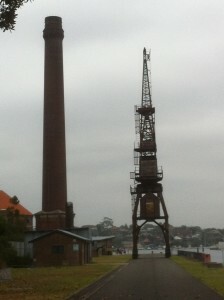 Old cranes creating our own version of the Eiffel Tower and old beam bending machines reminding me of the Easter Island statues all adding to the layers and chapters of Cockatoo Island’s history. One of my favourite places was the convict mess hall, it had a mood to it that is impossible to describe, oh if only the walls could talk, I imagine you would be enthralled for hours. Escape from the island by convicts was rare as most could not swim. One successful convict was Fred Ward, who later went onto become the bushranger Captain Thunderbolt. The pattern making building the size of a ship as they had to create actual size templates, had a sense of awe about it as you realised these ships were built and designed without the technology of today. The plans and pattern templates were all hand drawn and engineering calculations done without the assistance of calculators and computers. Absolutely amazing skills that are sadly being lost today. The last part of the tour allowed our inner child to emerge as we went into one of the tunnels on the island. Instantly the temperature dropped significantly and the beautiful coloured layers of the sandstone was on show. In contrast to the sheer scale of the turbine building the tunnel was contained and quiet. The impact of the space was such that even The Designer Chicks stopped talking and imbued the atmosphere and adventure of the space. 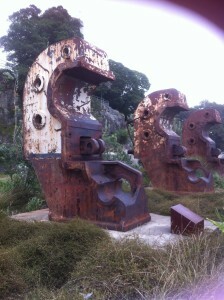 Visits to places such as Cockatoo Island is important for designers to stimulate our creativity, let our imagination run wild and be inspired by history.